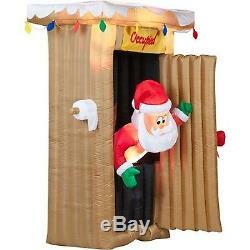 Gemmy Airblown Christmas Inflatables 6' Tall Animated Santa Coming Out of Outhouse Scene. 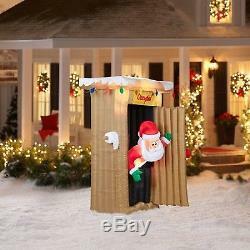 Express your holiday spirit with this quirky Animated Airblown Santa Coming Out Of Outhouse Scene. Santa is adorably embarrassed as he peeks out of this outhouse! This decoration features energy-efficient LED lights, and deflates for easy storage between seasons. Animated; Santa opens door to outhouse. Deflates for easy storage between seasons. Overall dimensions: 43"L x 43"W x 72H. STOCK AVAILABILITY: At the time of listing this product, there is more than one of this item in stock. And we will work with you to resolve it to your satisfaction. The item "Gemmy Airblown Christmas Inflatables 6' Tall Animated Santa Coming Out of Ou" is in sale since Sunday, October 30, 2016. This item is in the category "Collectibles\Holiday & Seasonal\Christmas\ Current (1991-Now)\Yard Décor". The seller is "liptak_market*" and is located in US. This item can be shipped to United States.